Combine the rice and water in a saucepan; bring to a boil; cover and reduce heat to low. Simmer until water is absorbed, 15 to 20 minutes. While the rice cooks, mix together 1 1/2 cups coconut milk, 1 cup sugar, and 1/2 teaspoon salt in a saucepan over medium heat; bring to a boil; remove from heat and set aside. Stir the cooked rice into the coconut milk mixture; cover. Allow to cool for 1 hour. Make a sauce by mixing together 1/2 cup coconut milk, 1 tablespoon sugar, and 1/4 teaspoon salt in a saucepan; bring to a boil. 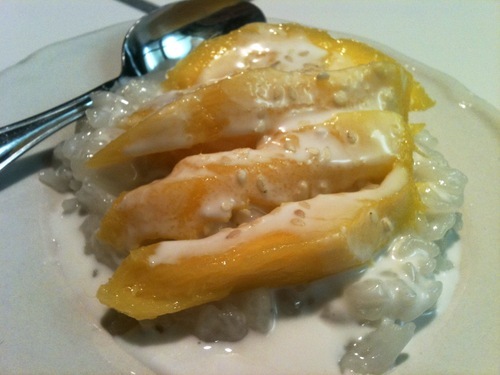 Place the sticky rice on a serving dish. Arrange the mangos on top of the rice. Pour the remaining coconut milk over the mangos and rice. Sprinkle with sesame seeds.